The first leg of the trip takes us from Lusaka in Zambia to Sandoa in the South West of the Democratic Republic of Congo. I first met Charlie on the road out of Cairo in Egypt towards the Red Sea, him on a bicycle and me on a motorbike. We then continued to bump into each other on our way south and despite him being on a bicycle we arrived in Cape Town in South Africa at roughly the same time! From here we made the plan of crossing the little-understood, seldom-visited and much self-abused "Democratic" Republic of Congo. So when Charlie reached Lusaka in Zambia on his way back north, I was to meet him there and exchange my motorbike for a bicycle. While we wait for our visas in Lusaka, Charlie gets his bike ready for the first leg of the trip. For £96 I picked up a Buffalo Charger in Lusaka, It was a bit small but I hoped it would do! Taking a break next to another badly parked African truck. The sun sets over our tents. The one advantage with camping in a cemetery is that we are the only fools to be hanging out there at night. Kasumbalesa, the last town before we cross into the Congo. A Congelese woman carries her produce to the market. Dodging inbetween trucks and taxis as we arrive into Lubumbashi, the mining capital of the DRC. Women lie on the floor of an Evangelical church in Lubumbashi after they fall into uncontrollable fits after believing they have 'caught the holy spirit'. A small roadside restaurant outside Likasi. Lunch wasn't quite like how it was advertised. Kolwezi was the end of the tarmac for us. The locals warned that the road from here gets very bad, to begin with we could not understand, and then later on we understood! On the search for a good out of the way spot to camp. Sandy roads aren't fun; sandy roads and getting a puncture is even less fun. An abandoned steam train left from the colonial times at Mutshatsha. A Panhard armoured car lies destroyed from the previous Congo wars. Far away from the road and protected by the dense bush we pitch up for the night. Charlie sits unamused that he has spent more time pushing than cycling. A crowd gathers as we enter Tshimbalanga. Catching some rest in the midday heat. Aswell as a dusting from a freak Bus. Two brothers in their store in Sandoa. The DRC Part 2. - The Congo by River. A collection of images of the view ahead from our motorbikes whilst we travelled across Africa, from Edinburgh to Cape Town. A cold start to the journey across a snow covered Europe. The sun sets in the White Desert of the Sahara, Egypt. In search of the Meroe Pyramids, Sudan. Kids and their donkey haul water into the town of Kassala, Sudan. Heading towards the Eritrea border in Sudan. Gridlock in the Tigray hills in Northern Ethiopia. Camel trains on our descent into the Danakil Depression in Ethiopia. Dusty villages of the Afar people in the Danakil Depression in Ethiopia. One less truck to dodge whilst in Ethiopia. The Turkana people of North West Kenya. 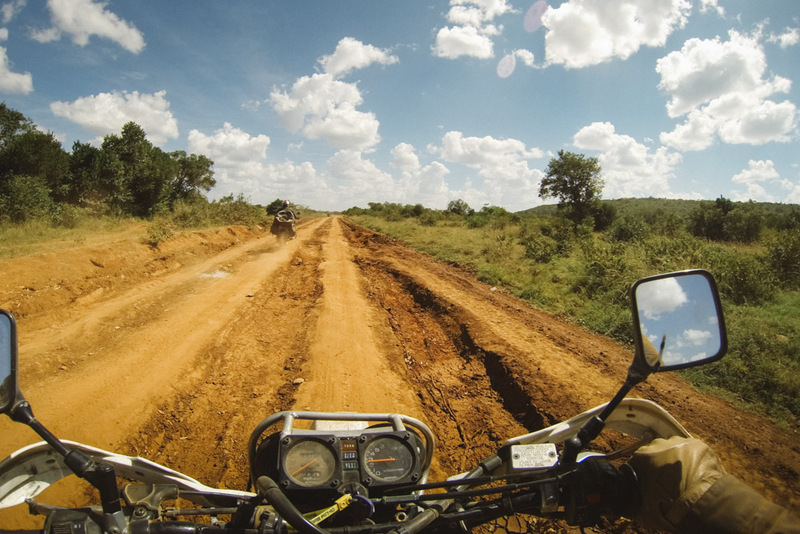 Picking the smoothest route south in Kenya. The village chief greets us and get us to sign the villages guest book as we arrive in the small village of Namasale, Uganda. The rains start in Queen Elizabeth National Park, Uganda. Locals hitch a ride up the rolling hills of Burundi. A river ferry take us across the Malagarassi River in Tanzania. Out of the salt pans and into the open dry grassland of Botswana. 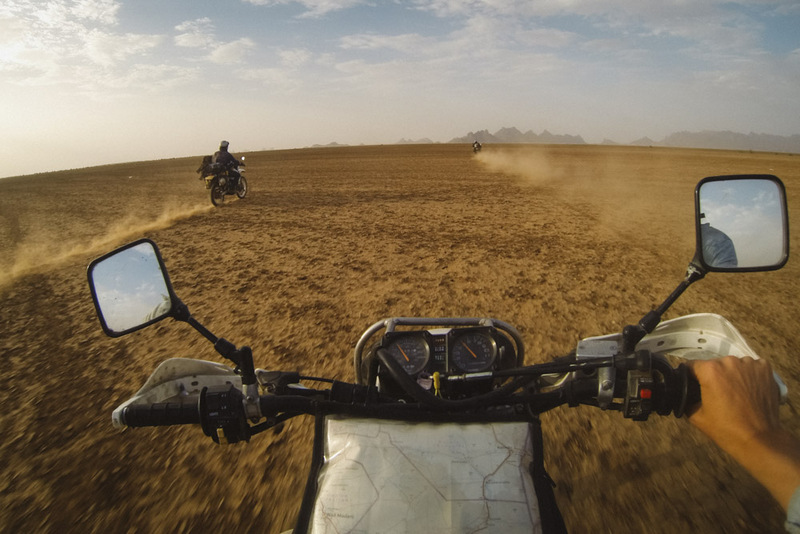 Sandy trails in North West Namibia. Follow me on Instagram, Twitter or Facebook to keep updated about future photo stories.